I had several reasons for wanting to create this private meditation chapel. The first was to create a space in this climate of religious intolerance– a space in which anyone could feel welcome, regardless of race, gender, faith, etc. The second was to try and re-create, on a much smaller scale, the feeling of the Baroque cathedrals in Europe and South America, with the challenge of using much more humble materials. That sense of height and grandeur and a feeling of being transported out of the everyday, and into another realm. The dizzying use of gold and over-the-top decorative designs and flourishes. A place to inspire quiet, loving kindness, peace, and tolerance, as well as a space for reflection, prayer, and meditation. In creating the pieces for this space, I was playing with light and reflection and shadow. I used the red enamel paint , glass, lacquer, red and gold leaf and glitter to contrast with the matte and worn surfaces of all the found wood materials in the assemblages. This idea of shadow and light…of wrestling with your demons by opening your heart…the dark night of the soul…the light at the end of the tunnel…the spark of life. The Altar to the Heart of Compassion was conceived and created in 2003 as the centerpiece to a series of stations or visual prayer boards. Based on the Buddhist Metta Sutta, these 14 visual prayers were created on old ironing boards to mimic the shape of the row of animal skin stretcher frames along the back of the altar. Their shapes reminded me of the gothic arches often seen in old cathedrals and churches. In each, I was looking for a sense of height and linearity and a movement of energy radiating out and up with the idea of trying to invoke in the viewer a feeling of the heart being opened and lifted up. The circles are used over and over to establish a sense of rhythm and to represent this idea of the opening and closing of the heart…the chakras… the cycles of life…the spinning of the world and universe…the cosmic void…the third eye. There are also repetitions of string and thread. I see these as the ties that bind us… the karmic threads…the spinning together of single threads to create something greater…the umbilical cord…the silver cord to the heavens…lines of energy…cocoons. Also included are a set of custom made meditations cushions, a prayer chest to hold incense, candles, shawl, books, etc, a halo, and a ceiling piece complete with a pair of hands blessing the top of your head as you sit on the cushions in prayer or meditation. I hope you enjoy this installation. May it take you out of your daily life and transport you to a place of quiet grace. Please take a moment, if you like, to sit down gently on the cushions and soak up the feeling of the space. Namaste. "Visual Prayers" 2 each approx. 56" x 14" x 4" 2005 $900.00 each 6 from Visual Prayers series. 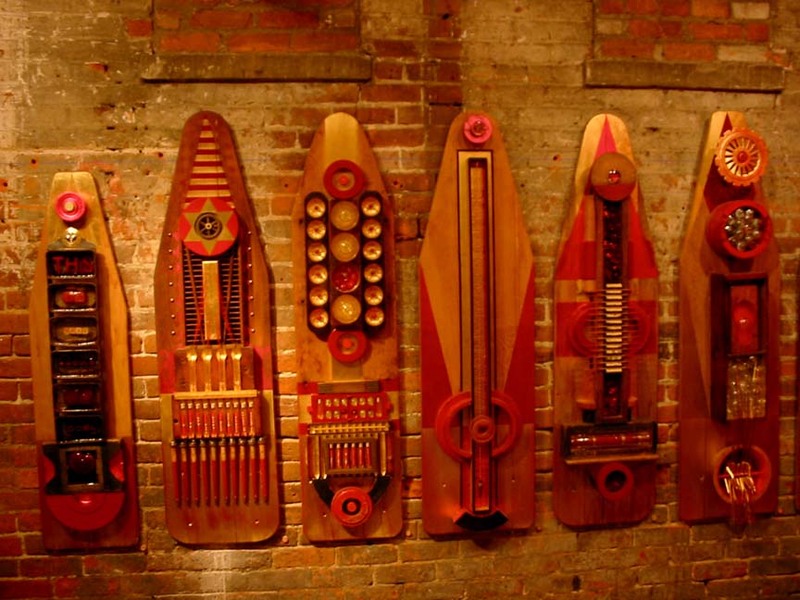 Part of the meditation chapel installed at Gallery Project for the God Show in the fall of 2005 in Ann Arbor, Michigan. "Visual Prayers" 1 each approx. 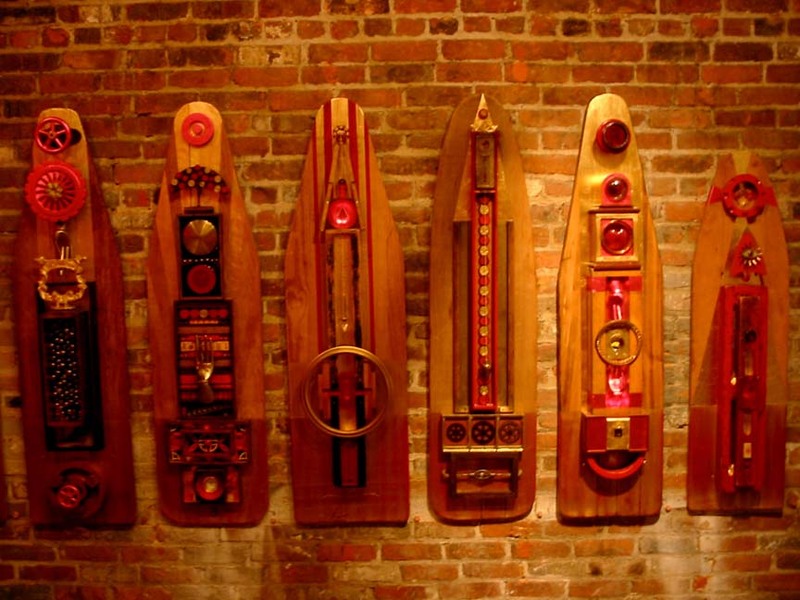 56" x 14" x 4" 2005 $900.00 each 6 from Visual Prayers series. 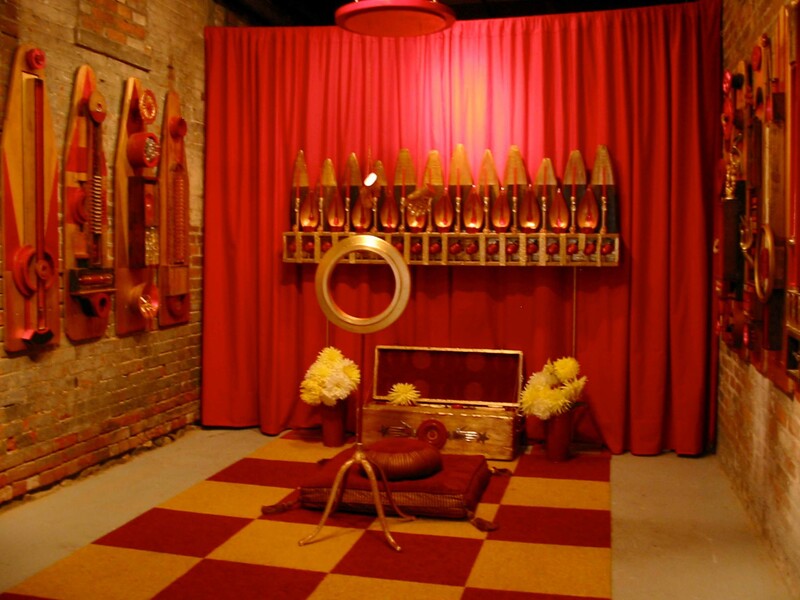 Part of the meditation chapel installed at Gallery Project for the God Show in the fall of 2005 in Ann Arbor, Michigan.